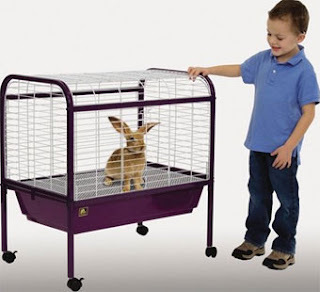 This small animal cage is great for rabbits & guinea pigs and can also be used as a breeder cage for puppies, kittens, and other animals. This cage includes 6.5 inches deep plastic pan, removable bottom grille, 2 large doors, and tubular steel stand with easy-rolling casters. The heavy-duty plastic pan is supported along the length of the cage for additional stability and can act as a urine guard if the cage is used without the bottom grille. The height listed includes the stand. See more.